January is already over, can you believe it? I don’t know where that first month of 2015 went, but I do know that this is time of year when I start giving some serious thought and attention to planning my goals for the year. The end of a year is always crazy with holiday stuff, and I like to give myself a chance to let life settle back to normal before I start getting serious about my goal planning. I like to fix myself a cup of tea or coffee, gather all my supplies and spend an hour or two dreaming big dreams and writing things down. I didn’t always make the time to set good goals. Oh, I always set goals, and sometimes I even wrote them down. But they were always fairly generic with no direction. One long term goal was to buy a house. Not when I wanted to buy one, not where, no thought to how I was going to do it, or what I was going to need to meet that goal. In truth, that wasn’t a goal, it was a dream. Only an idea of something I wanted to do some day. It took me a while to get the point where I am now, where I set aside time at the beginning of the year to think about what goals I want to achieve; to check-in with how I’m going on other goals; and to write a new plan or update an old one to help keep myself on track. You see, I’ve learned that there is power in writing things down. It used to seem silly to me. What difference does writing something down really make? Well, it turns out, it makes a lot of difference. Sometimes more than others, but it does make a difference. And in the case of our goals, it can be the difference between never seeing them happen and meeting those goals each and every time. Don’t believe me? I’ll use this little ole blog as an example. Waaaaaay back when I first started this blog, Travis and I had just decided that we wanted to work towards moving closer to family and friends. After formulating our plan and figuring out a loose time line we wrote things down. I had a bunch of different to do lists, a bunch of questions we needed to answer, and we were working on a more specific timeline that we kind of figured would be 3-5 years. Then I wrote the Lessons Learned: We’re Moving On post. Two days later, I posted Fresh Dose of Reality, and a Couple Free Printables. Travis got a job offer, and we were looking into it. The rest is history! Six months after writing Lessons Learned, we had the truck packed and were moving. THERE IS POWER IN WRITING DOWN YOUR GOALS! You don’t have to share your goals with the internet, but take time to write them down, you might find your surprised at what happens when you do. I like to take set aside some time near the my birthday to check-in on my long term goals and make some new ones if needed. As I said it above it starts with a cup of tea or coffee. I need time to let my mind wander and dream, and having something soothing or comforting to sip on while I do that is a must for me. I grab my writing utensils, my planner, goal setting worksheets and a pad of paper and get settled in somewhere quiet.. You could do this anywhere really; at home, at a coffee shop, sitting on the front porch, the back deck…anywhere really. Wherever you choose, make sure you can focus on the task at hand. I start by looking at the goals I set the previous year and seeing where I’m at with them. Did I meet them? If not, why not? Is the goal still important to me, and to do I need to revise my plan for this year? Then I look at my long-term goals. For me, a long-term goal is anything that will take longer than a year to achieve. I’m a list person, as you all know, so I have a list of things I want to accomplish or do in my life. Some might call it a bucket list, I just call it my list of dreams. This list is fluid. I add to it and take away from it. I reference it when making my long-term goals because sometimes, many of those items could fit into one long-term goal. Such as travelling to new countries. Rather than setting a long-term goal of going to Ireland and the Ukraine (two places my husband and I really want to visit) my long-term goal could be to spend two months traveling through Europe, with a list of places we want to see while we’re there. First I choose my dream, my end result. Then I take a little time to make it more detailed. What does that really look like? Where are we going to go? What are we going to do? How long will be there? I write that all down at the top of my Long Term Goals Worksheet. researching the countries we want to visit and making a list of places we want to go and things we want to see. Some of these short-term goals can be started well in advance, and others will need to wait until closer to the completion date. This is why writing down your goals is so important. It allows you to check in on them from time to time to make sure you’re still on track. It allows you to evaluate where you are on your way to achieving them, and allows you to make changes to adjust for things that are happening in your life now, and make new supportive short-term goals that will help you get there. Once I’ve checked in on my long-term goals, added any new ones I want to accomplish, and made a note of any short-term goals that could help me along my way, I turn to my short-term goals. For me, a short-term goal is something I want to accomplish in less than a year. My process is the same as it was for long-term goals. I jot all of that down on my short-term goals worksheet. Some of my short-term goals are supportive goals for my long-term ones. I still use the printable above, but I make a note at the top of the sheet to let me know which long-term one it’s in support of. Then I hole punch them all and put them in my planner. For me, this is really important. Keeping them in the same place allows me to check in on them often and make sure I’m staying on track. Keeping them in my planner means that I’m able to easily reference them when making my plans for the month or week. 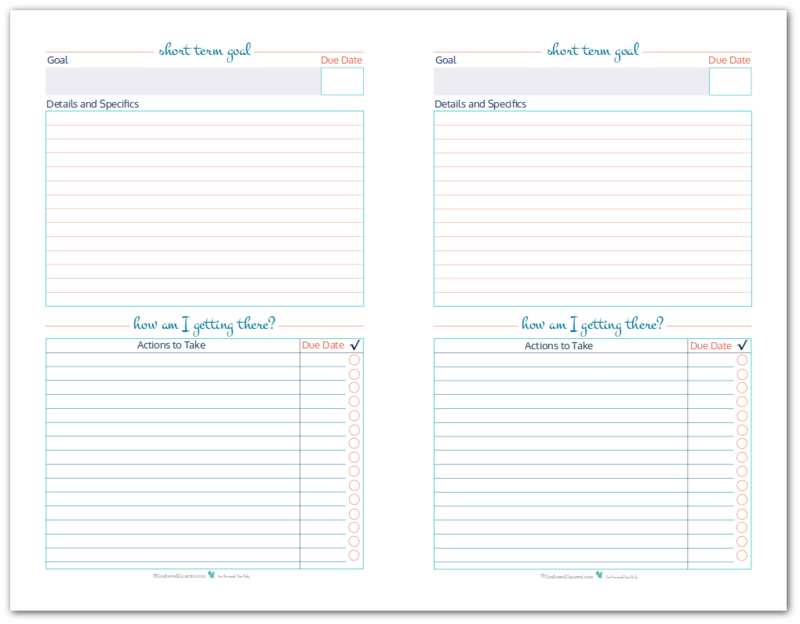 And because I know that so many of you like to use the half-size printables, I couldn’t resist making these in half-size format. I have three for you to choose from. 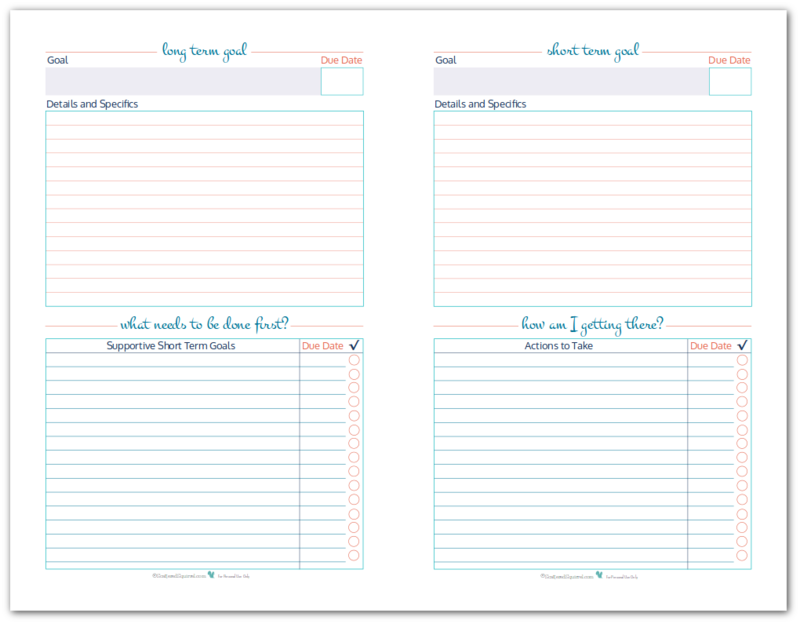 Just in case you want to print yours back to back and set up a goal setting book, or in case you just want to take one of each for a test drive to see if they’ll work for you, I put the long and short term goals worksheets together on the same page. A dream is something we hope for, long for, wish for or aspire to. A goal is the plan that makes our dreams come true. And above all else, have some fun with this. Dream big, reach high, and create the map that will lead you on your journey to making those dreams come true. Goal Setting for the New Year is fun, but don’t forget to take some time to celebrate the ending of the old and beginning of the new. Need a little inspiration? We’re planning a family friendly party for us and the boys this year and using this great New Year’s party guide from The Super Mommy Club to help us out. And no party is complete with the fun and games, and these printable games from Brain Power Boy are just fantastic! The whole family can have some fun with these. I can’t wait for our little family celebration to start! Do you set short and long term goals for yourself? Do you have a system you use that works for you? Linking up at these fabulous places around the web. I like how you have the mini goals to go along with your long term ones all on the same page – that makes the most sense to me. In order to work on the big stuff, you have to have a list of all the little stuff, too. I’m glad I’m not the only one that made sense too. I always wonder when I make printables like this if it make sense to anyone but me. lol I like seeing what I need to work on, and why I’m working on it, especially with long term goals, because sometimes the things we doing are boring or a drag and keeping the end goal in mind helps me keep on keeping on. I love this idea! Makes you accountable for your goals. It’s been a big help for me. I’m a visual person, I need to see things written down or I’ll forget about them. The accountability is a nice added bonus. Love them. Thanks so much for all you do. 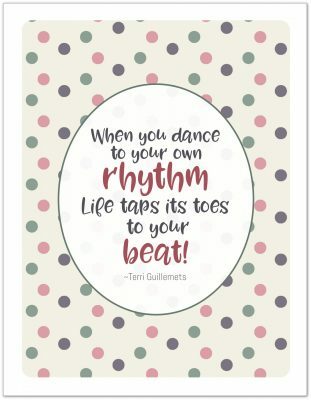 This printables are AWESOME! I wrote my goals at the end of December and now I have somewhere to record them! Thanks Clare, I’m glad you like them. I needed somewhere to put all of mine in one place so I’m not so scattered. I love these planner pages. I am so excited about using them. Thank you for sharing. I’m happy to hear that you like the goal planners. They’ve been a big help for me so far, it’s nice to see everything written down. I hope you find them helpful too. thanks for sharing this… I always want to do everything. I’m hoping this will help me narrow my priorities! also, love the name of your site!!! Hi Jen, thanks so much for taking the time to leave such a nice comment. I’m with you, my list of things I want to do keeps growing. I’ve found that starting with a couple things I really want to do and a couple things I need to do is a good way for me to strike a balance. 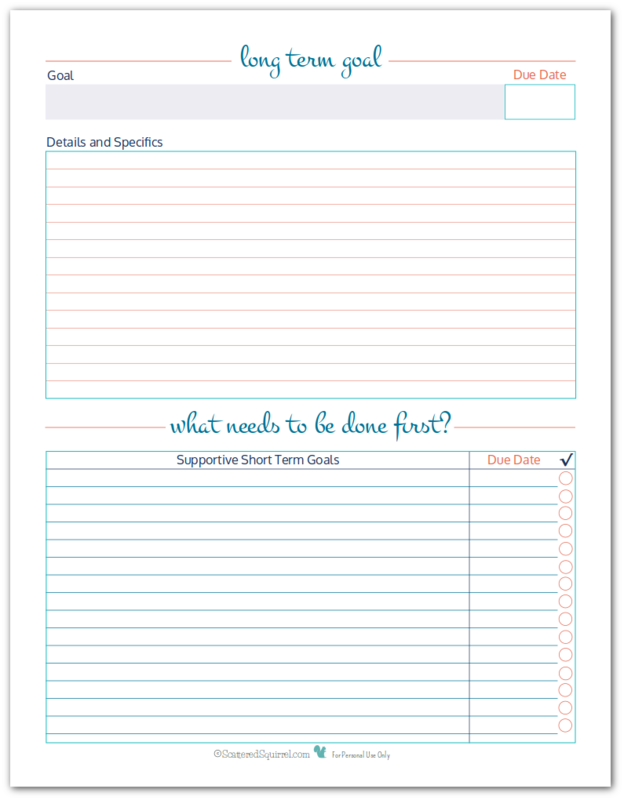 The long-term and short-term goal templates are very beautiful and don’t look dull or drab. Thank you very much. You’re very welcome Manoranjan. I hope you find them useful.